Can you Reheat Ham? | Can You Reheat? My wife made a huge ham for dinner last night, and we wanted to have leftovers for dinner tonight. What is the best way to reheat ham without it drying out? Can you reheat Ham? 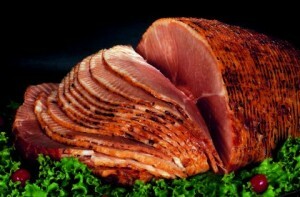 Ham is one of the special meats that can he reheated in just about any fashion you can think of, and it will still stay as moist as it was when it first came out of the oven. You can pan fry it, microwave it, or put it in the oven if you have some time. Pan frying is pretty easy, no butter or fancy pan are required. Simply find a pan that is stove safe, and that your piece of ham fits on the bottom. From there, turn the heat to Medium and let warm for about four minutes per side. Use your nose to judge when to flip. If you notice black marks, flip it. Brown is the meat caramelizing. To microwave ham, place it on a paper towel, or microwave safe dish and microwave for about 45 seconds on power level HIGH. You will have to adjust the times depending on how thick the slice is. Typically two minutes will give a decent hunk of meat a steamy middle. For when you have a little time to wait, the oven is one of the best ways to ensure food does not lose its water content. Preheat your oven to 350 degrees F. Wrap your portion of ham in foil and place right on the racks in your oven. Allow the meat to heat through for about 20 minutes. Slice the meat in half and ensure that the middle is the desired temperature. Ham is great to have all year round. From giving your kids a stellar lunch of a hot ham and cheese sandwich, to taking a few slices to work for a quick, filling snack you can now reheat your leftovers, without having to cook the whole dinner.